African Fat Tail Gecko | Zoo Med Laboratories, Inc.
African fat-tail geckos are not as popular as their cousin the Leopard gecko, however they make equally fascinating pets and are a great choice for the first-time reptile keeper. African fat-tail geckos stay relatively small and have undemanding care requirements. As with many gecko species, success will depend on setting up the appropriate habitat and maintaining proper temperatures. These geckos are beautifully marked and have fascinating personalities. Over the years breeders have developed several different color morphs that have become available to hobbyists at all levels. Hatchling to juvenile African fat-tail Geckos can be housed in a 10 gallon terrarium. Young geckos can be housed together. Adult geckos will need at least a 20 gallon terrarium. Do not keep males together because they are territorial and will fight. A Repti Shelter™, Habba Hut™, or Cork Bark will provide a secure hiding place to help reduce stress. We recommend a hide-box on both sides of the terrarium. Always offer a humidity chamber for your gecko. Place New Zealand Sphagnum Moss in a ReptiShelter™ to create the perfect humid retreat. It is important to create a thermal gradient in your terrarium. This can be accomplished by providing a Basking Spot Lamp and an Under Tank Heater on one side of the terrarium. By focusing the heating elements toward one side of the cage, you will naturally provide the proper thermal gradient. Although these nocturnal animals will not generally bask, providing a basking spot will maintain proper temperatures in your terrarium. Placing a flat rock under a basking site will help provide belly-heat to aid in digestion. New studies have shown that many nocturnal geckos will greatly benefit from UVB lighting. Zoo Med’s NATURESUN ™or REPTISUN®5.0 Fluorescent Lamps can be used to illuminate your terrarium and create a photoperiod (light cycle) that will help promote natural behaviors. African Fat-tail Geckos live in tropical regions that experience a prolonged dry season. It is important to offer access to cool humid burrows and rock crevices where they spend most of their time. 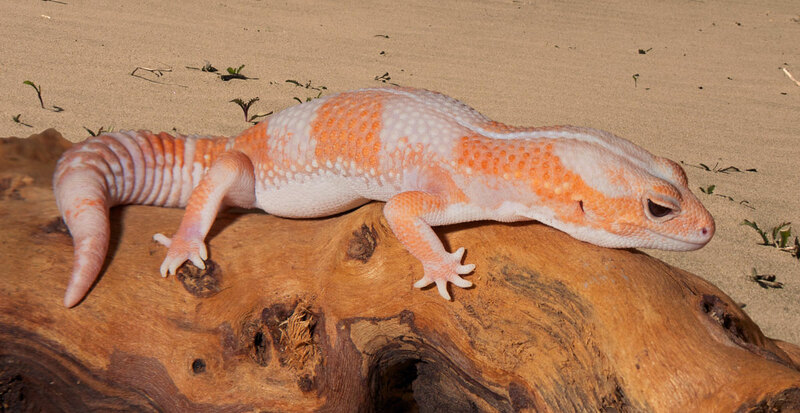 We recommend mixing Zoo Med’s Eco Earth® & ReptiSand® together to make the perfect African Fat-tail gecko substrate. This blend will hold moisture, while allowing the geckos to create their own burrows. Hatchling African fat-tail Geckos will do best on Cage Carpet such as Zoo Med’s Eco Carpet. REPTISAND™, Vita-Sand® and REPTIFRESH™ are also excellent choices for housing these Geckos, just be sure to provide a humidity chamber if using these substrates alone. African fat-tail geckos are insectivorous and should be offered a variety of insects to stay healthy. Hatchlings: 5-7 small feeders daily. African fat-tail geckos should be fed crickets or mealworms dusted with ReptiCalcium® and ReptiVite™ as directed. Other insects such as waxworms, roaches, silkworms should be offered on occasion. Zoo Med’s Can O’ Insects are a great way to offer diversity to the diet. Always remove uneaten insects after each feeding.